I hope everyone had a great holiday weekend! Ours was great! But let's just say that over at our house, "Labor Day" was incredibly labor intensive. David and I spent the weekend (besides Saturday- go Dawgs!) 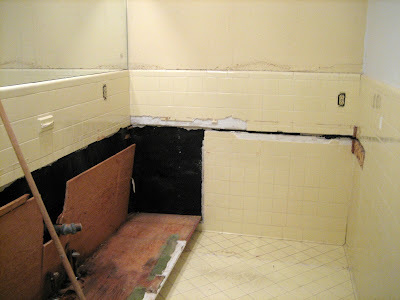 doing the bulk of the demo work on our master bathroom. 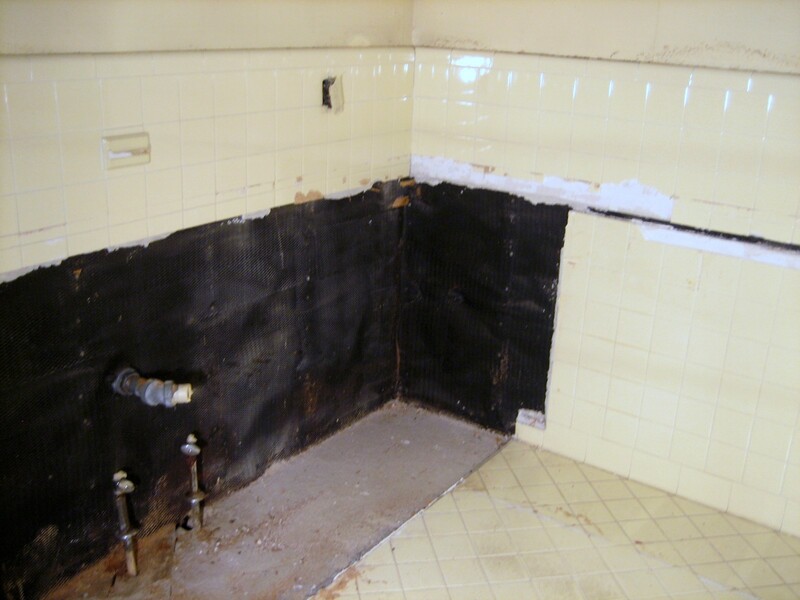 While we love the incredible character of our sixty year old mid-century ranch, we weren't too excited to have work with mid-century plumbing, tiling, fixtures, etc. Needless to say, we just jumped right in and started tearing the bathroom apart. 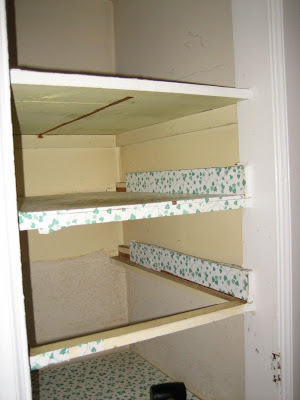 Our first step was to get rid of all of the fixtures, including the built in towel racks, the toilet paper holder, several soap dishes, and all cabinet doors and drawers. As you can see, we had lots and lots and lots of cabinets (seriously- who has that many toiletries?!) to remove. 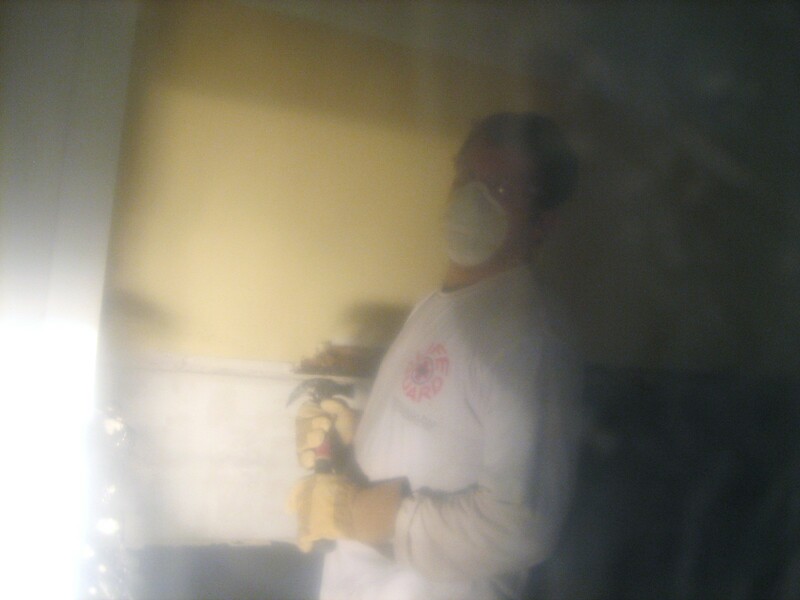 As soon as we started chipping, pulling and smashing the bathroom up, we both put on dust masks. We were a little worried about lead paint, since our house was built in 1952. It's likely that some portion of the bathroom was painted in a coat or two of the toxic stuff, so we thought we'd play it safe. Next, we started actually pulling up the cabinets. And when I say "we," I am proud to say that I actually mean ME! 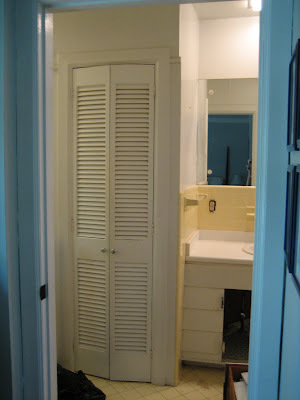 Armed with a mallet, a hammer and a crowbar, I actually pulled up most of these cabinets while David worked on disconnecting the toilet and sink plumbing. Can I lift my arms today? Absolutely not. Was it worth it to smash up a bunch of old, ugly stuff? Absolutely. Yes, I actually did that! Even with those ugly brown Crocs on! 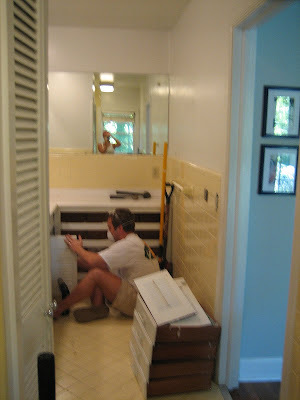 :) David had to jump in and help me with the last part of the cabinets, as it was built around the piping and I was a little nervous to tug on it too much for fear of busting a pipe. David sawed around what was left and removed it, piece by piece. Oh, FYI, we tossed all the scrap wood out the window into a big pile on the side of the house (which is thankfully hidden by a grove of trees so our poor neighbors don't have to look at it!). We plan to haul all of the trash to the dump at the end of our project. By the way... the hardest part? In my opinion, removing the gigantic mirrors that covered both walls above the vanities. They were SO heavy and I was SO afraid they would shatter at any given moment during their move. Thankfully, we got them down okay and they're going up on Craigslist in search of a new home. Next up? Time to remove that hideous, dirty yellow tile. We headed over to Home Depot and rented a demolition hammer to get the job done. Our local HD has an awesome tool rental section with a ton of options that are not too expensive. And it doesn't hurt that the guys who work in that department are incredibly helpful. 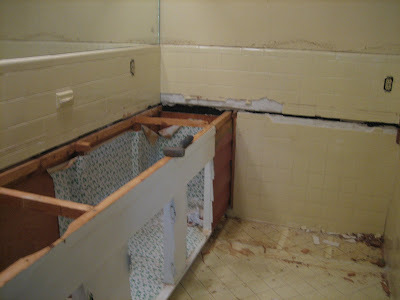 Unfortunately, ripping up the tile with a demolition hammer isn't exactly a two man job, so my sweet husband took over this task. We knew that dust would be flying eve-ry-wh-ere, so we taped plastic over all of the vents, outlets, pipes, etc. 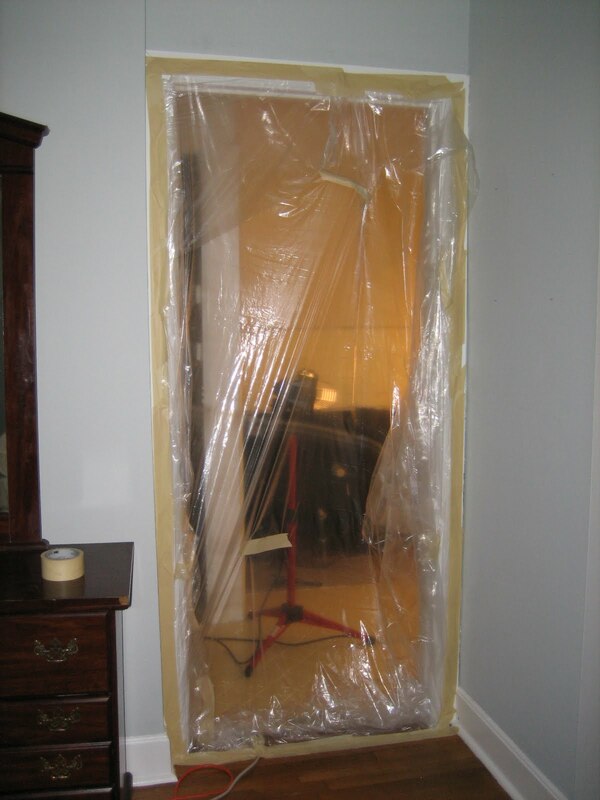 We also taped plastic over the door frame. So how did David get in and out of the bathroom, you may ask? He didn't. Poor guy was stuck in there for about five hours, hammering away. My view of the bubble boy. There he is, my guy behind the bubble. At about six last night, he finished hammering all the tile up. And the poor guy was so exhausted, I told him that we could just leave the shoveling for tonight (which will also be a lot easier once all of the dust settles). So he slipped out of the plastic and we quickly sealed it back up. A little mess behind the bubble never hurt anyone. 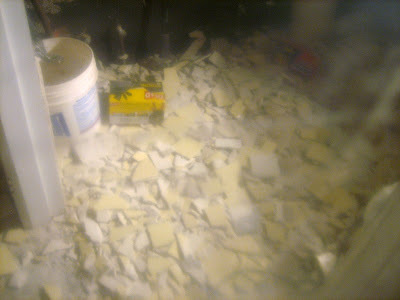 Here's what it looked like last night before bed (sorry- kind of blurry through the plastic!). This project will definitely be slow-going. David and I are pretty busy at the end of the month and with our crazy job schedules, we can really only work on the house on weekends. Honestly, we're thinking of a time frame of two or three months. Lucky for us, we have another full bathroom right down the hall, so it's not like we're in desperate need to finish this. This week, we're finalizing the general layout of the new space and the plumbing plans. I'll share those with you as soon as they're finished! And please, please, share your renovation stories and advice- we need all the help we can get! whew, im tired just looking at the pictures! great work! the only advice i have is, it has to get ugly before the pretty comes in, and sometimes it can take a while. good luck, can't wait to see more progress. Thanks, Londen! That is certainly good insight because it is really, really ugly right now! :) I just have to remember that there is a light at the end of the tunnel. Hopefully we'll have some prettier pictures to post sooner than later!! Look forward to seeing the finished room. 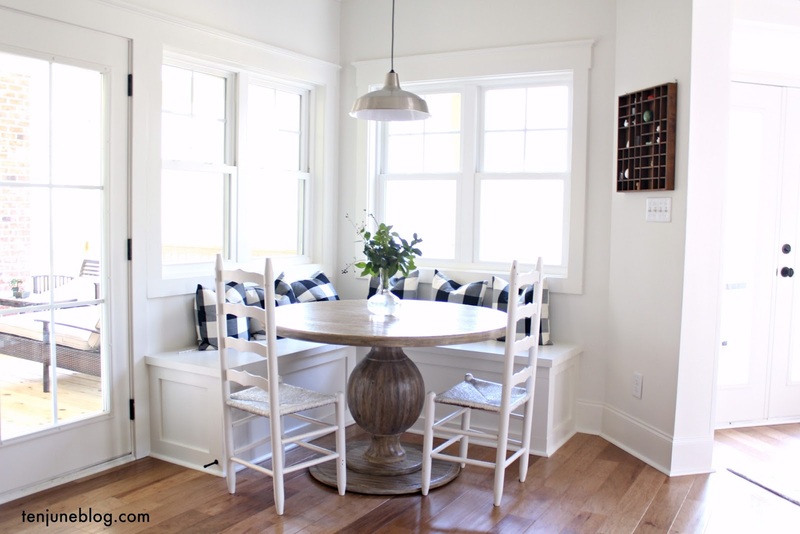 Would you share with me the color of the stripes you used in your office and what color and how did your sister paint her cabinets? Great job guys...I'm glad you didn't invite us over! Save a few of the 'pretty' busted up tiles and you can make a mosaic of some sort later! My mother-in-law did the tops of a pair of tables for the kids room at her house. As for my kitchen cabinets...We took down all the doors and then got to sanding. It took a lot of sanding to get rid of the varnish. Then we primed everything with 2 coats of primer and then painted with Behr Ultra pure white semi gloss paint. It took 2-3 coats for me to be happy. The best advise is to make sure the paint has had quite a bit of time to cure before working on the other side or you will have sticky spots. I think we let them sit at least 24 hours and sometimes more if it was humid. Good Stuff! 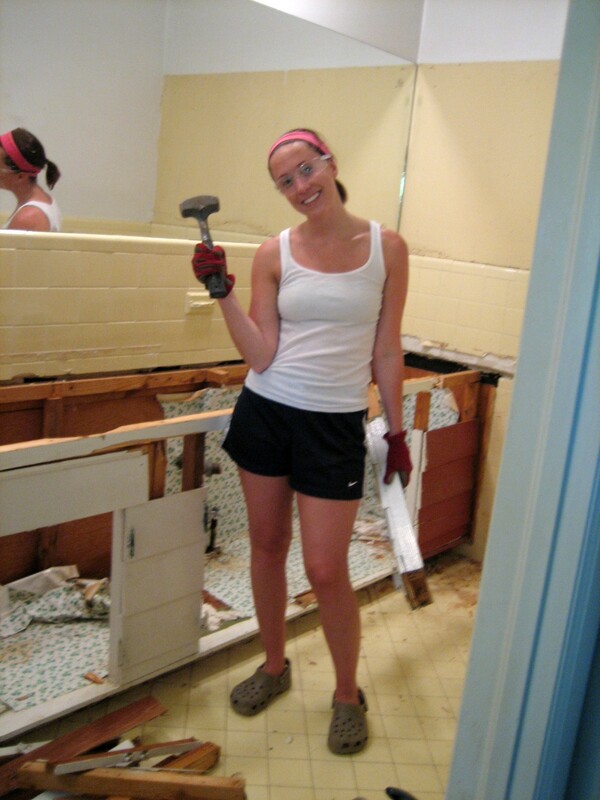 I love Demolition! Let me know if you need any help on the rebuild.